(Newser) – Tomorrow is President Obama's 51st birthday, and Republicans have designed e-cards in his honor—though they don't exactly wish him the most joyous of days. Instead, the RNC is once again offering a raft of politically-themed birthday wishes ("send your free Barack Birthday Card to friends & family!" it urges) highlighting everything it can't stand or loves to mock about the president, ABC News reports. 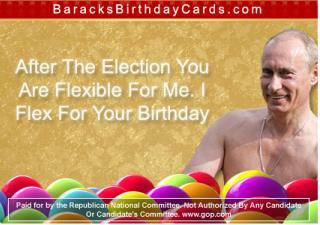 Question- Has the Democratic party ever sent mocking birthday cards to a republican president before? Sorry, no. We can never have police to protect us every moment, because the counties, states, or the federal government really does not care about you or your property. My husband is a law enforcement investigator of 23 years, and he has encouraged me to have my handgun on me at all times. We have had 5 different incidents of women being accousted in the parking lots of Walmart, Target, Kroger and The Mall. One 8 month pregnant woman lost her baby because of it. They shoved her to the ground...smack on her stomach. The best incident was a 72 year old grandma that two thugs followed her to her car and she whipped out her pistol and they ran. LOL A 32 year old woman can home with her 7 & 8 year old daughters, and a robber was in the house....he had a pistol...but she whipped out hers, and when he went to shoot...she shot him. The 2nd Amendment is for that right. And with the gangs on the rampage, and people being shot in MacDonalds, Steak House, Walmart,etc. I am all for the right to bare arms. It wouldn't be a problem if Obama had not cut the funding for law enforcement, and the SWAT teams and etc. to get rid of these gangs, thugs, and drug dealers who will cut you down in a minute. We should never give up any of our rights FREELY to the government. The States should retain their individual powers, and keep the Federal Government far away from State Govt. and out of our personal lives. When Germany gave up their weapons, they were defenseless, and herded into cattle cars. We cannot afford to give up any of our rights....without a fight!